What does a medical exemption from vaccination mean in the Olympia School District? Medical exemptions for vaccinations in the Olympia School District and Washington State might not be what they appear to be. On their face, these exemptions allow children who cannot be vaccinated (because of weakened immune systems, for example) to waive vaccination requirements and attend school. But, from what I've been able to gather from a public document request from the Olympia School District, the differences between personal-belief and medical exemptions is murky. So murky that (please read to the bottom), I wonder if doctors or any medical professionals are necessary for the medical exemption process. About a month ago, while the measles outbreak in Clark County was still new news, I updated what the vaccination rate for schools in Olympia was like. This was similar to other times I'd done this update, there are some scary high exemption rates in Olympia schools. But this time I noticed a new wrinkle: the top schools for personal-belief vaccine exemptions were also the top schools for medical exemptions. To me, this made little sense. If you were a parent of a child who had a medical reason to avoid immunizations, then I think you'd want to then use the herd immunity at your child's school to help prevent infections. What I could see was that there was a correlation between parents who would seek a personal exemption from vaccines, ones that would seek a medical one, and the school they chose. That made me assume that parents who are seeking medical exemptions are also not necessarily afraid to send their children into environments where a scarily low percentage of the children are vaccinated. This got me curious about the nature of medical exemptions in the Olympia School district overall. So, I made a public records request for all medical exemption forms that represent active students in the Olympia School District. These are the documents I received and this is the spreadsheet I put together summarizing what I found (folder with both files here). The district blacked out student names and addresses before they gave me the documents, but they didn't black out the names of doctors that signed medical exemptions. 1. Naturopaths are slightly more likely to sign medical exemptions. While 25 percent of the medical exemptions I received from the school district, naturopaths only make up 20 percent of the provider types (family, pediatric and naturopath) that I assume would likely be presented with the form. Some forms were also signed by physician assistants and nurse practitioners. 3. What does a medical exemption even mean? Over 75 percent of the forms had both the "medical" box and "personal" exemption marked on the form. This seems to undercut the meaning of the medical exemption form altogether. What may seem like an inexplicable bunching of both medical and personal belief exemptions (why would an immune deficient child attend a school full of unnecessarily unvaccinated children?) isn't. What it really could be is just a larger group of children whose parents declined vaccination for personal beliefs but got their doctor to sign a medical waiver. You might have already perused the documents the school district gave me, but if you haven't, this is (as far as I can tell) a full-on medical exemption form with no details, exempt the student's name and a parent's signature. No medical professional's name, no medical professional's signature. This isn't even a double-marked personal/medical exemption. 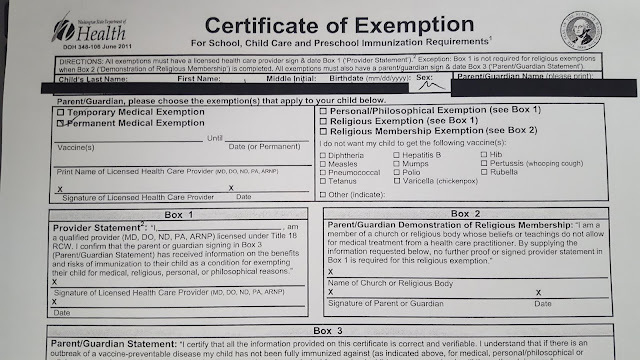 This is a pure medical exemption that is on file at the Olympia School District, that purported to clear a student to have not been vaccinated for medical reasons, with no medical professional's name on it. If a parent can sign a medical exemption form and it be accepted by the school district, what is the point of even requiring them at all? When you think about population change in a growing region, you think of it as a constant. And, even though Olympia has been lagging behind Lacey in growth rate for the past few decades, Olympia is still on a gradual population climb. But, that population growth has not been consistently spread across the city. In fact, there are numerous neighborhoods that have actually lost a significant amount population in recent years. To explore this phenomenon, I built a map in a tool called Policy Map. The variable I used was the rate of change in the five years between 2013 and 2017, according to the American Community Survey. These are interesting years because it was a time when the incoming population of our area outpaced new housing. So, at least in theory, our available housing became more crowded, not less. A small caveat about this data. It is based on survey results collected by the Census Bureau. Being survey results it is less accurate than actual decadal census data. That said, all of these neighborhoods have seen measured losses of over 13 percent, which would probably outstrip any margin of error. 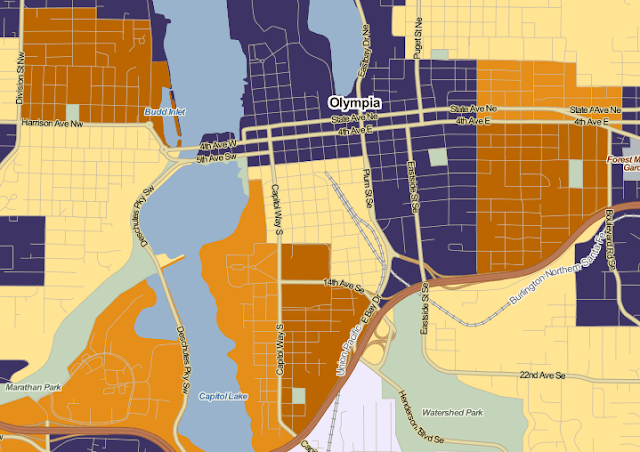 The first neighborhood in Olympia that lost a significant amount of population (again, more than 13.46 percent) was this one up in far northeast Olympia. 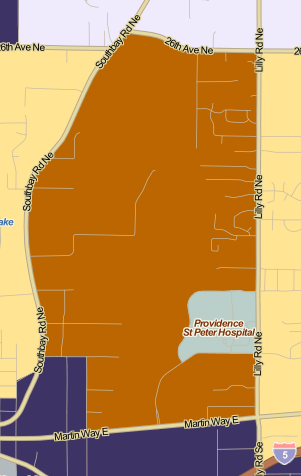 This Lilly to Southbay Road neighborhood is the outlier in the type of neighborhood that has lost population though. The much more typical neighborhood (in dark brown below) is an older, inner residential neighborhood. I've written about these neighborhoods before and in my mind, these are the neighborhoods that beginning in the late 1970s started seeing the impacts of growth cascading out of downtown. They experienced an influx of what we now call "missing middle" housing, multiplexes and small apartment buildings. But, instead of welcoming the growth and naturally more dense neighborhoods, these neighborhoods downzoned and pushed additional growth towards the edges of town. This new growth, in turn, paved over farms and forests. What happened after we downzoned and the middle went missing in Olympia? But, why now are these neighborhoods that up until a few months ago were protected habitat for single-family homes losing population? Obviously, the neighborhoods weren't becoming denser. I'm having a hard time finding data on the change in household size in the same year, but it stands to reason that stable households would have children age out eventually. If the parents stayed put, then theoretically, the population would decline. Usually, about when there is something in the news about an outbreak around here, I'll go to the state Department of Health and find out what the vaccination rates are at our local schools (and here). This time around, there is a measles outbreak just about an hour south of us, so I thought it would be nice to narrow in specifically on exemptions (personal, religious or health) for the measles, mumps, rubella vaccination. According to the most recent data, there are a handful of schools in the Olympia area with fairly high exemption rates for the MMR vaccine. Here is the most recent data from the state and the spreadsheet I used. What leaves me scratching my head about this data is that when you parse out the medical and personal exemptions, they seem to follow the same general pattern. Schools with high personal/religious exemptions also have high medical exemption rates. When I first started looking at this stuff, I assumed medical exemptions would be evenly dispersed across the area. It follows that since all of the schools that have high exemption rates are schools you either generally lottery into or opt into, that the personal/religious exemptions would gather there. In the same way that opting into certain schools is an expression of a family's choice, so is opting out of vaccination. But the medical reasons for not being vaccinated, I don't think, would be more general and would not necessarily be tied to a family's school choices. Here is an explanation on how those exemptions work. You've heard about herd immunity, or how the vaccination rate in a group of people that protects people who can't receive a vaccine. This is why a 16 percent exemption rate at ORLA or a 12 percent exemption rate at Lincoln are sort of scary. According to the CDC, an immunization rate of 94 percent is necessary to prevent pertussis from persisting in a community. That is above the 88 percent that the exemption rate at Lincoln would indicate is that school's immunization rate.